Where can I find product pricing and setup fee information? When I place my order, how long will it take until I receive it? Can you speed it up to meet a deadline? Do you offer graphic design work? Will I have to pay extra to make changes to my proof? Can you work with our graphic designer? Where do I find templates to choose from for the design of my card? What is the difference between a new order & a reorder? Should I edit my picture to remove the redeye or crop my photo? What size and file format should I use to send my Image? will you choose from two photos? and can I choose from two proofs? Do you have our mission's logo? Is there a limit on wording? Generally we post a proof for you within 3 business days. Display proofs are generally ready in 5 business days. Once you approve your proof, the production time will depend on your product. ($25 for Photocard products, $75 for Postcard products and Displays) Rushed orders have their proof posted by the following business day (2 days for Displays) and the production time is reduced as indicated below. Rush production does NOT affect shipping delivery speed. Photocard style Basic Cards & bookmarks ship the next available shipping cyle. Displays typically ship in 3 business days. UPS 3-Day, 2-Day and Next Day delivery are available and their names of course reflect their delivery speeds. This will NOT affect production speed. 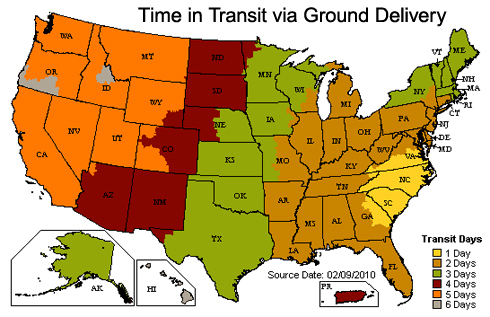 Below is a map that indicates the number of business days your order will take via UPS Ground delivery. Click here for shipping charges.